I wanted my 6th and final tattoo to be in the most visible spot I've every had tattooed, AND I wanted it to be amazing. Matt totally fulfilled my every expectation and then some. And he's a super nice guy to boot! 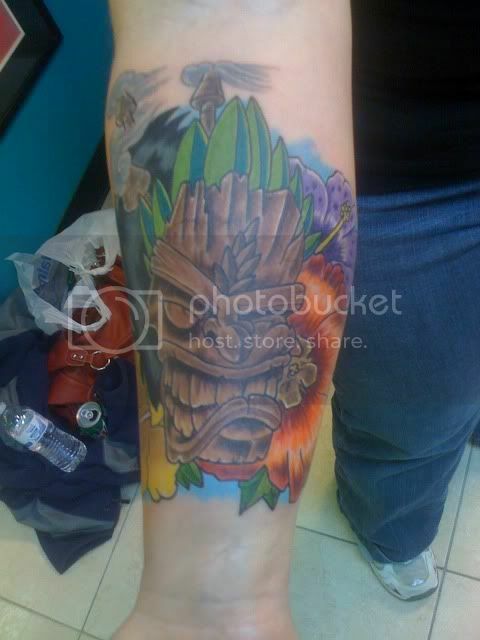 LOVE my new tiki tattoo; I will wear it with pride. awesome!! love the color and detail! sick color work, how come this will be your final tattoo ? It will be my final because sadly, when I got married, I had no IDEA how addictive tattoos could be, since I didn't have any. And now that I've gotten 6, the hubby is a little over it. Since I DO enjoy staying married, I've decided to stop. That's NOT to say that I will not get my older stuff ... ahem, *touched up*, lol.